There are times when you feel good about yourself for having shown restraint in not clicking a picture. While we were carrying out observations for a highway safety project, I notice a state road transport bus stop a little ahead of its designated bus stop. A mother and her little daughter get down. The girl starts defecating on the side of Asian Highway 43. Passengers sitting by the window watch this patiently without showing any disgust or impatience. No one complains about stopping the bus or the open defecation. Would the reaction be similar if it was an adult instead of a child? Throughout our research on sanitation, we see people making one seemingly strange distinction: kids can defecate anywhere, next to the home, on the street. It’s neither seen as unhealthy, nor is it considered undesirable. Even villages that have claimed to be free of open defecation do not consider kids defecating in the open to be a problem. This is a serious issue; one that needs to be addressed both at the design as well as the perception level. The Indian toilet arguably isn’t very child-friendly and we need to find creative ways of making it user friendly for kids. The perception that it is not harmful or disgusting because it’s a kid, gives it a social sanction in a way. Old habits die hard. While we are building many new toilets in India, we are also building a set of future adults who have grown up defecating in the open. Unless we change this perception of children’s excreta being okay, we are not going to build a sustainable model in sanitation. And then, there are times you kick yourself for not being quick enough to click a picture. As we were driving towards Hyderabad, I see a rather interesting signboard at the Jadcherla bus stand. It says ‘Ultra Modern Toilets’. 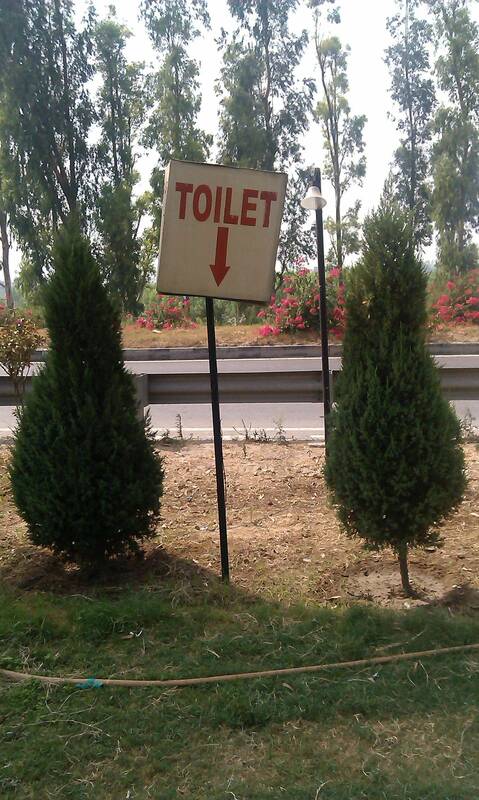 The board was not on top of a toilet complex, but on top of a restaurant inside a state road transport bus stop, where many long distance buses don’t stop. So, it’s not essentially for the ‘city’ folks. You would expect a restaurant to talk about good food or variety of cuisine. This one is using ‘modern toilets’ as a draw. This should give us a lot of hope. Wicked problems are problems where defining the problem itself is a challenge. As a result there is a high degree of subjectivity in everyone’s perspective of the problem as well as the solution. Sanitation practices we know have evolved over years. The behavior is a consequence of multiple environmental factors such as infrastructure, education, lifestyles, social norms. The history associated with the problem also leads to multiple beliefs. For example, we could argue that defecating in the open is a natural activity and using toilets is more a modern and unnatural act. On the other hand, we also know that the practice even though done individually negatively impacts the collective. With such varied arguments for the same problem, its good to have multiple perspectives in tackling the issue. There may not be a right or wrong solution to the problem. Depending on how we measure the impact, solutions may simply be better or worse. While it may be hard to determine the most optimal solution, we need to look at solutions that are practically feasible to implement and scale. As part of the project, we have recently implemented a few behavioral experiments in the villages in / around Gulbarga district. The interventions are designed on behavioral science principles that target the non-rational mind. While not ruling out the approach entirely, we have stayed away from using monetary or infrastructural incentives to change behavior. That said, we do recognize that the final package may require both. These experiments are being tested for both impact and feasibility. With the help of on-ground support, we have developed a system of monitoring and feedback. While the results are still awaited, the philosophy is to use a non-linear, iterative experimental approach of problem solving. For the past several months, I have been pondering whether it is really possible to have a completely open defecation free society, where most people are still engaged in small landholding farming, or as farm labour. Millions of people go out to their fields early in the day, often walking long distances, and when nature calls, where are the toilets in the fields? Or on the way? We would need toilets at the wayside, at the field level, and at the home. Is this doable? If not, is defecation in the field, with some due process followed (burying/covering up the human waste, followed by hand and feet washing) necessarily a public health hazard? It would be good to get some expert opinion on this. can we achieve the same public health goals that we anticipate from ending open defecation, by other means that are more appropriate to the current realities and cultures of the people in our country? Maybe some “out-of-the-toilet” thinking and innovation is needed urgently. Certainly we cannot tolerate any more the disastrous health outcomes, especially for children, from some current sanitation practices. So, how do we encourage better and modern on-farm sanitation and hygiene without building closed toilets everywhere? We found this picture which we thought depicts the state of sanitation in India quite aptly! The idea of Centre of Gravity is nothing new. The oldest cave painting is probably 10,000 years old. Long before we started our journey in a corner of Bangalore, communities have been sitting around telling each other stories, passing on values and visions to one another and to the next generation. All along the history of mankind, there have been leaders who knew what it ook to inspire a nation to walk towards a different future. 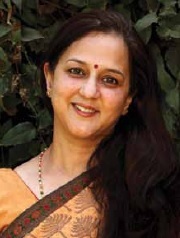 However, communication seems to have lost its way with the coming of age of advertising – with the best minds of the society – artists and intellectuals focusing all their energies to get a housewife to buy a particular brand of detergent or a teenager to choose a pair of jeans with a great attitude. Right from our college days, many of us had a strange suspicion that there must be more to communication than selling soaps and shampoos. This search to find greater meaning and joy with our work eventually led us to form Centre of Gravity in late 2005. We have come to see that communication has a larger role to play in society than advertising. It can motivate mothers to adopt healthier behaviours like washing hands with soap. It can educate school owners and teachers on new ways of teaching and learning. It can promote a good cause like human rights. It can stop a dangerous one like Genetically Modified food. It can simplify complex concepts like micro-health insurance and financial performance. It can inspire students and professionals to choose more meaningful careers. It can help an organization express itself in myriad forms. It can be the voice for the voiceless. Having peeled off the many layers of advertising over the years, we seem to be finally seeing and practicing communication for what it truly is – a tool for inspiration, understanding, self-expression, education, promotion of all that is good. Centre of Gravity is working on generating demand for toilets in Davangere district, Karnataka, as part of this Behaviour Change Communication project. 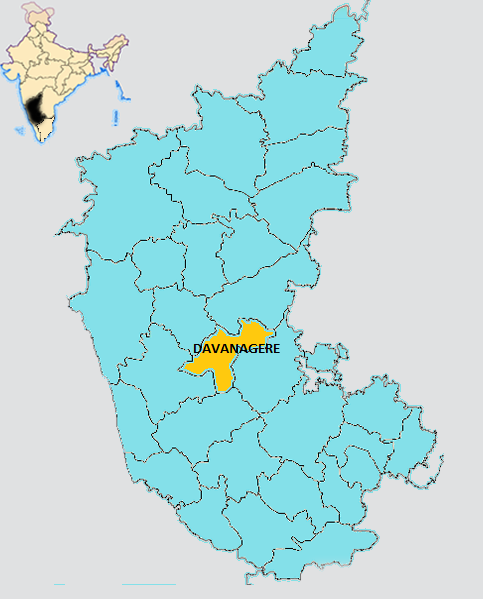 Selecting a district in Karnataka for Behaviour Change Communication: why Davangere? Under the Behaviour Change Communication project, it was envisaged that a communication campaign would be created from a strategy. This campaign would be piloted in one district of Karnataka. For the communication agencies to carry out their immersive research for the strategy formulation, Arghyam was in discussions with the the Rural Development and Panchayati Raj (RDPR) department, Government of Karnataka, and district officials from across the state. The district selection for the research and pilot implementation of BCC project was a long process. Around 10 districts were shortlisted for this intervention, and in-depth research was done to narrow it down to one district. The selection criteria were based on the demographics, geographical location, achievement under NBA, amenability to a behavior change communication intervention, availability and access to water and good governance in the districts. Based on these criteria, Davangere was finally selected for the BCC research and pilot project. The district is centrally located and has cultural influences from north and central Karnataka, which is a large part of the target population for further scaling up. Further, the district administration is quite strong and committed to the cause of sanitation, which we felt were huge positives in terms of getting their support and cooperation for this project.